Today when I came home from picking up the minnies, I was thrilled to find a lovely package waiting for me at my door. It was a package from my Lilly Pulitzer Secret Santa, Elizabeth!! Any kind of swap or exchange is so much fun for me. Siv organized this wonderful swap for the Lilly Pulitzer fans on Facebook and I jumped at the chance to participate. Elizabeth's package was perfectly wrapped and had so many preppy presents! Here's what she sent: There is a pink and green jewelry box with an adorable ring in it. Super preppy plates for my minnies have Maryland crabs on them! There was also a hand made tissue cover that is part of a development program for 400 women in the Dominican Republic. Everything is absolutely lovely. Thank you so much, Elizabeth! I appreciate your thoughfulness. You made my day! I'd love to do a swap for my bloggers for Easter or an upcoming holiday. Would you like to participate in a swap of some kind? I've done cookbook swaps, ornament swaps, and all kinds of other swaps. It's so much fun. As always, thanks for reading. Be sure to sign up to follow my posts. 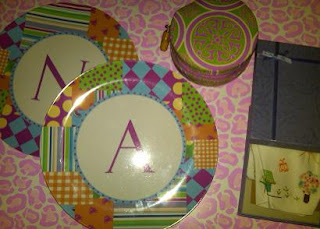 I have a very "ORIGINAL" Lilly Pulitzer giveaway to share with you when I reach 100 followers. And thank you for your sweet comments on my post. I think my husband is pretty amazing... and stay tuned! Part II is how we met! Swaps are so fun and you got some fabulous goodies! I love it. What a great gift! Awesome! Thanks! I'll do a swap on the blog soon! This will be so much fun. @The Siler Family I'm in Frederick. Someone posted another comment about a MD/DC/VA get together. Would you be interested?